The basement-dwellers of the NHL's Western Conference tripped up the top team Monday when the Los Angeles Kings blanked the Calgary Flames 3-0. The Kings won their third straight, but won't see the post-season. Calgary's penalty killers held Los Angeles scoreless on three chances with a man advantage, including a five-on-three. But the Flames power play was 0-for-4. Kings defenceman Drew Doughty was booed whenever he touched the puck at the Saddledome. He told Sportsnet earlier in the day he had "no respect" for Flames forward Matthew Tkachuk. Doughty and Tkachuk tangled early in the third with Doughty taking a slashing penalty. Calgary wasn't able to generate a goal, however. Los Angeles laid 22 hits to Calgary's 11 and kept Flames shots to the perimeter where Campbell could see them. 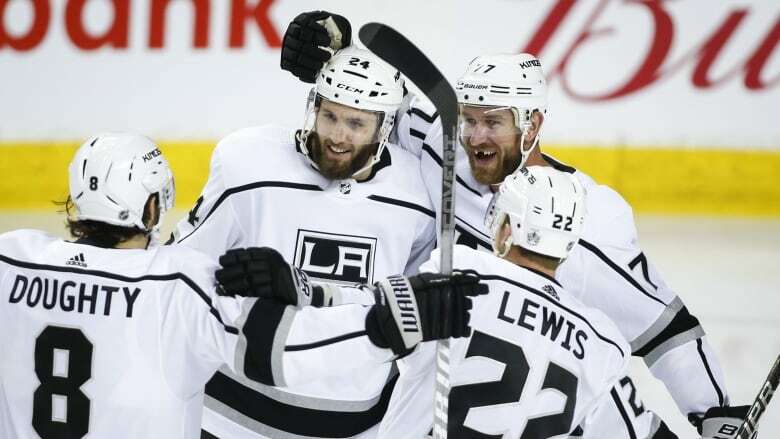 "Obviously Jack was incredible for us and made some big saves at key moments that kept us in the game," Kings defenceman Dion Phaneuf said. "They're a deep team, a fast team, they play with structure. I thought we did a really good job tonight and we deserved the win. "The shot clock didn't show as much of that, but at the end of the day we found a way to put more pucks in their net than they did in ours." Los Angeles ended the first period and opened the second with a two-man advantage, but didn't generate a goal with it.